A bystander watches as Chicago police investigates a street where multiple people were shot on Sunday in Chicago. It was an especially bloody weekend in Chicago. Shootings left a dozen people dead and many more injured. The police have traced the violence to gangs. Now the city's mayor and police superintendent are calling for neighbors to help stop the bloodshed. NPR's Cheryl Corley reports. CHERYL CORLEY, BYLINE: The shootings came after activists and Chicago residents recently shut down two of the city's major roadways protesting both neighborhood and police shootings. Those appeals did not blunt the violence that occurred between 6 p.m. Friday evening until 11:59 Sunday night, one of the city's most violent weekends in recent history. Police say there were 33 shootings. Police Superintendent Eddie Johnson says it left him angry and frustrated. EDDIE JOHNSON: Because if anything, it should underscore the continuing issue that we have with illegal guns and offenders out on the street that are willing to use them. CORLEY: And Chicago mayor Rahm Emanuel called the ongoing violence a tragedy. RAHM EMANUEL: What happened this weekend did not happen in every neighborhood in Chicago, but it is unacceptable to happen in any neighborhood of Chicago. We are a better city. CORLEY: No arrests have been made, but Johnson says police think a small subset of individuals, mostly gang members playing by their own rules, are involved. 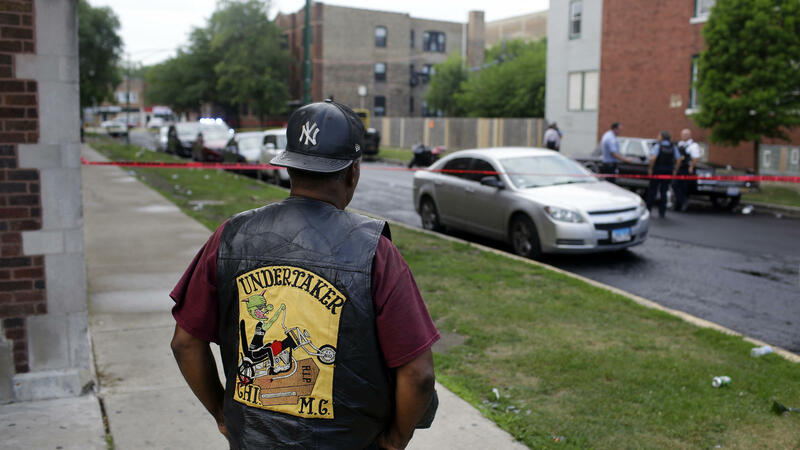 The majority of the shootings occurred in four of the city's police districts on Chicago's South and West Sides. CORLEY: At Stone Temple Baptist Church on Chicago's West Side, about two dozen kids are making slime at the church's Safe Haven program. The program is designed to give them a safe summer place. The church is located on a block where a mass shooting occurred over the weekend. In two separate incidents early Sunday morning, shootings left 10 young people in the neighborhood injured. Most of the victims were teenagers, the oldest was 25, the youngest 11. And a 17-year-old girl was killed. Rebbecca Morris, who runs the Safe Haven program, says news of the shooting was alarming. REBBECCA MORRIS: When it happened, somebody texted me, said, was it any of our kids at the program? I said, no, it wasn't any of the kids that would come off the street into the program. So it weren't any of ours that got shot that day, and I'm really thankful for that. CORLEY: Chicago Congressman Danny Davis who represents the area says there's a reason why so many children and innocent bystanders get injured by the shooters. DANNY DAVIS: They're looking for somebody who may be in the gathering. But inadvertently, they often strike non-targets. They don't know how to really handle the weapon. They're not necessarily shooting at the little children or a baby. CORLEY: Chicago's mayor and the police superintendent say the city has just too many guns on the street. Over the weekend, police seized 60 weapons and arrested 46 people on gun charges, none tied to this weekend's shootings. And Superintendent Johnson says police can't do it all. He says it's time for residents in these traumatized neighborhoods to give them some help. JOHNSON: You all know who these individuals are. They come to your homes every day, sleep with you every night - grandparents, parents, siblings, significant others. You know who they are. CORLEY: Today the Chicago Police superintendent had hoped to share better news. Chicago homicides actually dropped by 20 percent so far this year and the number of shooting victims by 17 percent. Johnson says while he's pleased with that improvement, the carnage over the weekend shows how much more work the city has to do. Cheryl Corley, NPR News, Chicago. Transcript provided by NPR, Copyright NPR.